It’s 99 degrees in the shade but a cool 72 degrees in your home thanks to Willis Haviland Carrier. It just so happens that in the month those of us living in the northern hemisphere need it most, the air conditioner was invented—July 17, 1902—to be exact. Imagine how different our lives would be without cool air. Carrier didn’t set out to cool the world. A graduate of Cornell University, with a master’s degree in engineering, as an employee of the Buffalo Forge Company, Carrier was challenged to find a solution to the humidity problem a printing company in Brooklyn was experiencing. The dimensions of paper were fluctuating with changes in heat and humidity in the plant, and in the process, the registration of the four-color printing process was affected. Carrier said he received his “flash of genius” on a foggy night as he stood on a train platform. If I can saturate air and control its temperature at saturation, I can get air with any amount of moisture I want in it. I can do it, too, by drawing the air through a fine spray of water to create actual fog, he recalled thinking. Within a year, Carrier completed his invention, which became the building block for modern air conditioning. In the system Carrier devised, air was forced through the filter of a piston-driven compressor, where it was pumped over coils that were chilled using coolant. The cold air was then expelled into a closed space with a fan, cooling the room and stabilizing the humidity. The immediate result: one happy printer. The long-range result was far more reaching. As word spread, manufacturing facilities clamored for Carrier’s invention. He continued to make refinements and improvements, and in 1906, Carrier was granted U.S. Patent No. 808897 for the Apparatus for Treating Air. Soon after, Carrier conceived the idea of adjusting humidity by heating the water spray and controlling the dew point temperature of the air leaving the conditioning machine. His law of constant dew-point depression, according to a company brochure, was “the greatest single factor in modern air conditioning.” He based the design of an automatic control system on this discovery and, in 1914, was granted U.S. Patent No. 1,085,971. In 1905, 29-year-old Carrier was made head of the engineering department at Buffalo Forge, directing research and supervising all design applications. Two years later, Carrier’s invention was installed in a pharmaceutical plant in Detroit and a silk mill in Wayland, N.Y., with a guarantee of 65 percent relative humidity throughout the year. But the biggest accomplishment that year was the first sale to an international company, Fuji Silk Spinning, in Yokohama, Japan. Carrier’s company continued to make inroads in Japan, installing the country’s first air-conditioned building in 1933, and four years later, in the world’s first air-conditioned ship—the 8,000-ton Koan Maru. By 1907, management at Buffalo Forge recognized the opportunity air conditioning held for the company and created a subsidiary, Carrier Air Conditioning Company of America. Carrier immediately landed a contract with the Celluloid Company, which made film for the motion picture industry. Next came Gillette, where air conditioning reduced rust on razors. The list grew with dozens of installations in hospitals, meatpacking houses, confectioners, bakeries, breweries and food processors. Although barely a decade old, the industry was on solid ground. However, the start of WWI in 1914 brought increased economic uncertainty and management at Buffalo Forge made the decision to confine operations solely to manufacturing. Carrier Air Conditioning was immediately dissolved. In response, Carrier and six other engineers pooled their savings of $32,600 and formed the Carrier Engineering Corporation, which opened for business in July 1915. Three weeks later the company had its first contract—with American Ammunition Company in Paulsboro, N.J.—the first of many with ammunition companies that were critical to the Allied war effort. These installations saved lives by eliminating explosions and allowing operations to continue 24 hours a day. When the war ended, the company was recognized by the Department of War for distinguished service. 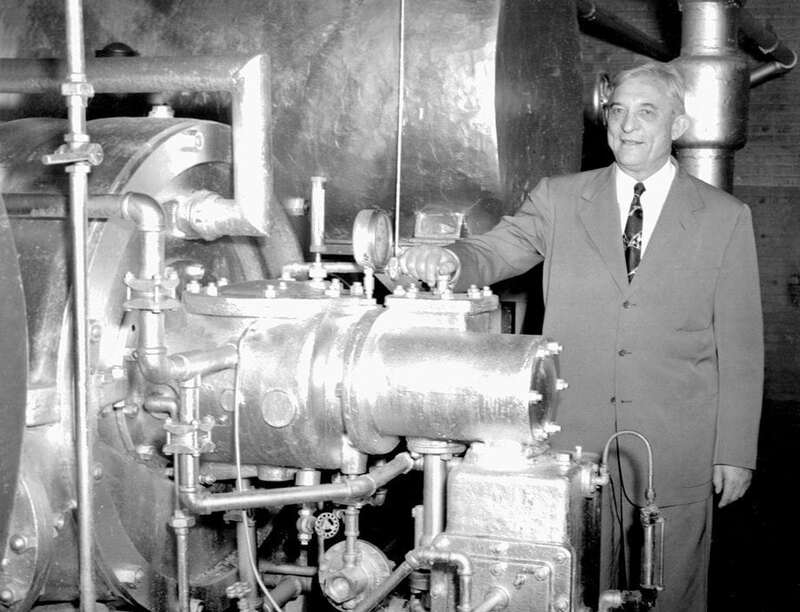 By May 1922, Carrier was ready to unveil what is considered his single most influential innovation: the centrifugal refrigeration machine, or “chiller.” While modern air conditioning made its mark on the way people worked, the centrifugal chiller would change the way they lived. Supported by 20 new patents, the chiller ensured human comfort in theaters, stores, offices and homes. The first sale was made to W.F. Schrafft and Sons Candy in Boston although the initial installation was at Stephen F. Whitman & Son’s candy manufacturing facility in Philadelphia. The 1924 installation of three centrifugal chillers in the J.L. Hudson Department store in Detroit, Mich., made for cool retail sales, but installations in movie theaters put centrifugal chillers on the map. First came Sid Grauman’s Metropolitan Theatre in Los Angeles, where improved installation of bypass circulation and downdraft distribution, producing a gentle flow of air through registers, improved the movie-going experience. The big test for Carrier, however, was at the Rivoli Theatre in New York City, where the movie, as well as his chiller, received rave reviews. Skyscrapers were next to benefit from centrifugal refrigeration. In 1926, the T.W. Patterson Building in Fresno, Calif., became the first multi-storied building to receive air conditioning. Among Carrier’s early customers were the U.S. Congress, the White House and Madison Square Garden. But the public demanded a home version, which Carrier gave them in 1928, when he unveiled the Weathermaker. Drawn to the railroad market, in 1929, Carrier began working on a steam ejector refrigerating system that used water as a refrigerant. By 1931, Carrier had devised a system to cool with steam. In 1903, he had realized that water could be used to dry air, nearly 30 years later he recognized that steam could be used to cool water. Remarkably, in a decade of hard times, Carrier Corporation’s international reach continued to grow throughout the Middle East and Asia. At the same time, Margaret Ingels, the company’s first female engineer, was promoting Manufactured Weather for the home. By May 1931, 600 Weathermakers had been installed, but 22 years later, the U.S. residential market had jumped to more than one million units. While, today, we may take air conditioning for granted, its impact on industry, culture and commerce can’t be overestimated. Thanks to Willis Carrier, we can beat the heat.